I recently bought New Flavors for Appetizers, a beautifully photographed cookbook written by Amy Sherman. The book is truly inspiring and if you enjoy cooking at all it is a great resource for delicious, generally simple appetizers. While browsing through the book one recipe in particular caught my eye called Asparagus, Leek & Goat Cheese Bites and I decided to prepare it one night as an extra addition to an antipasti selection with a few changes. Instead of the asparagus and leeks, I used fresh chopped herbs to flavor my version, and used a full sized muffin pan instead of the mini muffin used in the recipe. I knew some of my guests expected that evening loved mushrooms, so I used little dollop of a mushroom, sun-dried tomato relish I put together. The goat cheese flans received rave reviews, and I would certainly make them again as they were so easy to put together. 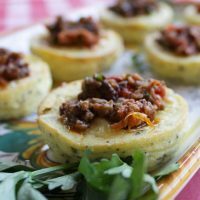 Instead of the mushroom relish, you could simply drizzle a little spicy tomato sauce over each flan before serving. 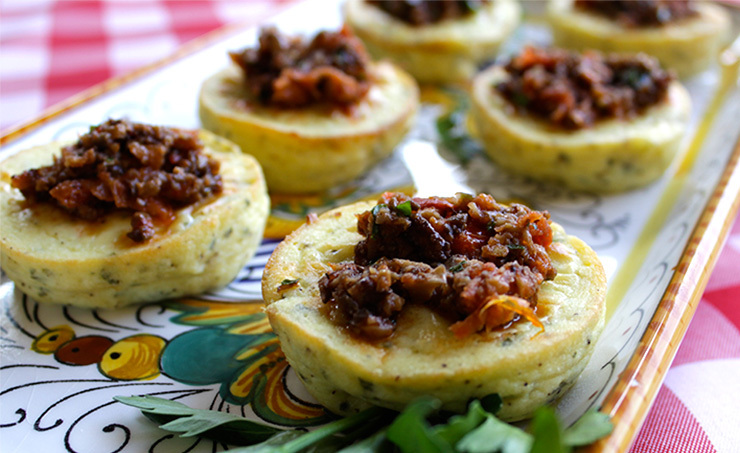 Light, quiche like flans topped with a zesty mushroom relish. Spray 6 spaces in the muffin tray with a spray oil. Mix together the goat cheese, ricotta, and eggs, then add the herbs and mix. Spoon the cheese mixture into 6 of the muffin spaces. Bake the flans for about 25 minutes or until lightly golden brown and puffed. Heat the oil in a frying pan, and cook the mushrooms until golden brown and tender. Finely chop together the mushrooms, tomatoes, and parsley. 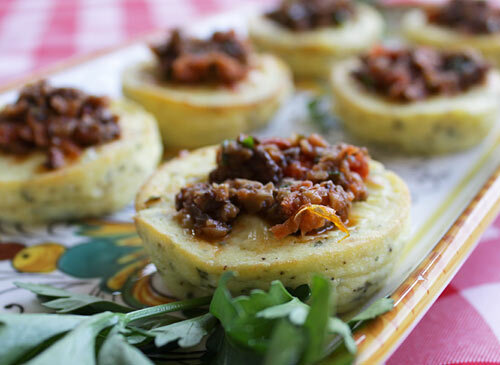 To serve, place the cooled flans on a tray and spoon a little of the mushroom relish on top of each.